The last of the four Beatles to stumble into the world, George Harrison was the youngest of 3 sons born to Liverpool bus driver Harold Harrison and his wife Louise. Early in childhood Harrison developed a keen interest in music, and after buying a cheap acoustic guitar at the age of 13 he devoted most of his free time to teaching himself to play the instrument. While attending Liverpool Institute he became friends with Paul McCartney, an older student and fellow aspiring guitarist that shared the same bus route to school; it was during this period that Harrison performed with The Rebels, a short-lived skiffle group he formed alongside his brother Pete and his close friend Arthur Kelly. After the dissolution of the Rebels, Harrison was brought to the attention of his friend McCartney's unit The Quarrymen, a rocking little combo led by charismatic singer/guitarist John Lennon. The young guitarist began constantly loitering about the band, emulating Lennon's manner and appearance despite the fact that Lennon -- initially, at least -- showed no intention of allowing some pimply juvenile to join. Harrison's undeniable skill with his instrument (demonstrated by a flawless performance of the Bill Justis instrumental piece Raunchy), combined with his bloody-minded persistence, inevitably won over the older musician and landed him the role of lead guitarist in 1958. In 1959 Harrison landed an additional gig as guitarist for The Les Stewart Quartet, the future of the Quarrymen being in some doubt due to personnel difficulties. A split between Stewart and the rest of the quartet in August of 1959 led to a partial combination of both bands under the Quarrymen name, which endured until October, performing as the house band at The Casbah Club. The Lennon/McCartney/Harrison line-up spent a brief period performing as Johnny and The Moondogs before adding bassist Stuart Sutcliffe in January of 1960, who re-named them The Beatals. The Beatals soon became The Silver Beetles, followed in rapid succession by The Silver Beatles, The Silver Beats and finally The Beatles in August of 1960. It was, of course, under this last name that the group traveled to Hamburg and began to establish both their musical style and the germ of their reputation -- although the first visit would be interrupted by then-underage Harrision's deportation back to England. By the end of their second German visit and their subsequent appearances at The Cavern Club, the Beatles were poised to attain huge success -- a potential that would be realized through the help of manager Brian Epstein. After the cementing of the Beatles' line-up with drummer Ringo Starr in 1962, the band's popularity exploded into an unprecedented pop culture phenomenon. Yet the persistent tendency of Lennon and McCartney to take their younger bandmate less seriously, inevitably led to resentment on Harrison's part -- a situation that was aggravated by the frustration of having only a few of his compositions represented on each release. It wasn't until the year prior to the dissolution of the Beatles that one of his contributions was released as a single -- the track in question, Something, eventually became one of the band's most covered songs. It was Harrison that introduced elements of Indian music into the Beatles' recordings (first realized on the track Norwegian Wood, from the album Rubber Soul, 1965), the guitarist's interest in the form leading him embark on a period of study with classical Indian performer Ravi Shankar in the mid 60s. After a visit to Rishikesh in 1967 to attend Maharishi Mahesh Yogi's meditation camp with his bandmates, this cultural interest was expanded to include India's spiritual ideas; two years later Harrison began an association with Shrila A. C. Bhaktivedanta Swami Prabhupada, founder of the Krishna Consciousness Society. The religious practices learned from both encounters were maintained throughout the rest of his life. It was these cultural interests that prompted Harrison to establish a musical output and identity separate from the Beatles, his first two solo projects being the partially Bombay-recorded soundtrack to the Joe Massot film Wonderwall (1968) and The Radha-Krishna Temple Album (1969), a recording he produced of ISKCON religious chants. In the unconventional vein of John Lennon's first two solo releases, he then issued the primitive analog synthesizer collection Electronic Sounds (1969). After the final dissolution of the Beatles in 1970, Harrison wasted no time launching his solo career with the triple-record set All Things Must Pass (1970); its first single My Sweet Lord was the first track by any of the former Beatles to reach the top of the charts. Six years later the song would be a source of legal problems for the guitarist, when a legal suit was successfully pressed on the basis of its resemblance to The Chiffons' popular single He's So Fine from 1962. A second triple LP set followed in 1972, this time collecting performances from Harrison's Concert for Bangla Desh -- a benefit event staged in Madison Square Garden with the participation of Eric Clapton, Ringo Starr, Bob Dylan, Leon Russell and others. Harrison's releases during the remainder of the decade -- Living In The Material World (1973), Dark Horse (1974), Extra Texture (1975), Thirty-Three & 1/3 (1976) and George Harrison (1979) -- were given a mixed and increasingly indifferent reception, although Thirty-Three & 1/3 (the first album issued through his own Dark Horse imprint) did return him into the top 30 with the single This Song. A brief resurgence in popularity followed the 1981 release of Somewehere in England, which included the John Lennon tribute piece All Those Years Ago (and featured contributions from Ringo, Paul and Linda McCartney); but its successor Gone Troppo (1982) marked the lowest point of his career, and Harrison subsequently abanodoned his musical output for the next several years. In the 80s the guitarist instead focused on his interest in car racing, and on his movie production company Handmade Films. It was through this latter project that his most significant output of this period was accomplished, his financial support making possible the creation of such films as Monty Python's Life of Brian (1979), Terry Gilliam's Time Bandits (1981), and the Michael Palin vehicle The Missionary (1982). An unexpectedly successful return to recording arrived in 1987 with the appearance of the Jeff Lynne-produced album Cloud Nine, a top-ten entry that spawned four top-ten singles (the #1 Got My Mind Set On You, Devil's Radio, When We Was Fab, and Cloud 9). This was to be the last solo studio effort released during his lifetime. Harrison and Lynne then continued their collaborative work as The Traveling Wilburys, an all-star ensemble that also included Bob Dylan, Roy Orbison and Tom Petty; their debut collection The Traveling Wilburys, Vol. 1 once again returned the guitarist to the upper reaches of the charts, as did the singles Handle With Care, Last Night, End Of The Line, and Heading For The Light. Orbison was to suffer a fatal heart attack several weeks after the album's release, but the remaining members of the group re-convened two years later to create The Traveling Wilburys, Vol. 3. With the exception of a document of his 1991 Japanese tour with Clapton (released in 1992 as Live in Japan), Harrison spent the first half of the 1990s away from the public attention that he grown to dislike so thoroughly. In the last few years leading up to his death, George Harrison re-entered public life with yet another flurry of activity. An improbable reunion with the two surviving Beatles took place in 1995 for the three volume Anthology CD series and its 8-part documentary counterpart -- a series which included two "new" Beatles pieces Free As A Bird and Real Love (actually a pair of Lennon demos embellished by the three other members and producer Lynne into full-scale tracks). Two much less pleasant incidents were next to bring the reclusive performer's name into the press: the first being the announcement of his struggle with throat (and then lung) cancer, and the second being his repeated stabbing at the hands of a mentally unbalanced fan (claiming to be on "a mission from God") who broke into his Oxfordshire home in December 1999. Work on another studio album was underway at the start of the 00s, but its completion was cut short when Harrison's lung cancer spread to his brain in November of 2001. At the guitarist's request, his remains were cremated and scattered over the River Ganges in India. The unfinished studio work, Brainwashed, was later completed by his son Dhani Harrison and collaborator Jeff Lynne and released a year after his death. 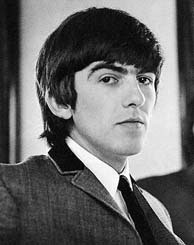 The month of the album's release, a tribute event (The Concert For George) was organized at the Royal Albert Hall in London, featuring a roster of Harrison's past associates that included both surviving Beatles, Dhani, Lynne, Clapton, Petty, Billy Preston, Ravi Shankar and his daughter Anoushka Shankar, Gary Brooker, Joe Brown, four of the five surviving members of Monty Python, and many others. Often given as 24 February, it is actually 25 February. The address listed on the death certificate is 1971 Coldwater Canyon, Beverly Hills, CA. However, this address does not exist, the nearest numbers being 1967 and 1977 Coldwater Canyon. Us Weekly reported that Harrison died at 3738 Laurel Canyon Blvd., a home formerly owned by Gavin de Becker and now owned by a trust, which is located in Studio City.